– German agents are different from American agents. – They make their money strictly by getting singers hired in theaters or concerts. -Anybody who asks for a retainer, monthly fee, money for help with a webpage, audition classes or the like is NOT getting singers hired and making a living from that. You will be asked to pay €15-20 for the pianist at an audition and perhaps something similar to defray room/venue rental, but in the words of one very good agent, anything else “is a scam”. – Exclusivity is not a general practice among German agents. – Most serious agents have stronger contacts in one region than another and understand that singers will work with other agents. – They know that if they’re getting you jobs you’ll stick with them. – Agents also want to see how how a singer does both onstage and as a member of a theater. They have a reputation and relationship to maintain with their theaters, and how you do reflects on them. – Exclusivity is probably worth saying ‘yes’ to immediately if one of the top agencies like Hilbert or Lewin (in Vienna) offer to sign you and ask it, and you feel that you are really ready to begin at the top. time with them so you should be sure you are comfortable with the relationship. there are now a plethora of agents working at all levels. Using your own web savvy and some of the resources on this site (link to a “Resources page) you will have to their websites and judge which ones seem professional and worth contacting. 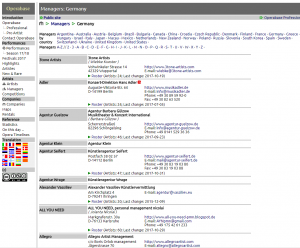 • Click Here to a list of agents on operabase.com and it’s list of German agents. The following screen shots show how to navigate this site to obtain the listings, contact and site information and check individual artist’s performance schedule so you can see where they’re working. 3. From the country list, select Germany. 4. The agent list will come up and contains most of the links and information you’ll need to evaluate agents. 5. 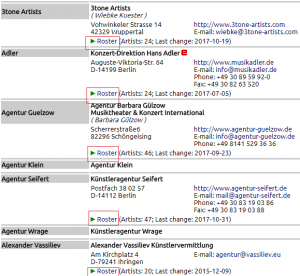 Click on “Roster” to see the agent’s artists. 6. 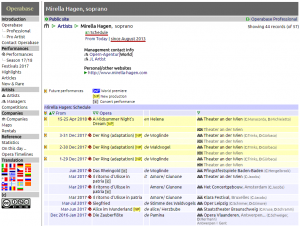 Click on a singer to see a performance schedule & details. I have randomly picked one of the agents and one of her singers’. It should be mentioned that while I believe this list to be comprehensive, the alphabetizing is confusing at times. You may have to look under various names for a particular agency. By any measure probably the biggest agency in Germany, this is a the government employment agency for all performing arts professions. 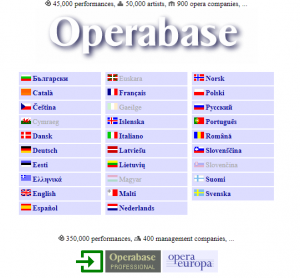 It has offices in 6 cities, 5 of which have opera/operetta departments. Depending on where you decide to base yourself, you should sing for 2 or maximum 3 of them. – They are in München, Köln, Hamburg, Berlin and Leipzig. – Each on primarily serves their nearby geographic region. – They are closely interconnected and all the agents share audition notes and info. – Many high level international singers started out in German regional theaters. theater in Meiningen, where ZAV has contacts. She now sings all over the world, but bought a beautiful house in the countryside there (such places are very affordable!). – German theaters keep lists of who has rehearsed and performed which roles so they can call for replacements if someone is sick. This is one way you make contacts in other theater, not to mention extra money. “Contacting Agents”, but be aware that E-MAILS AND ATTACHMENTS ARE LIMITED TO 4MB!!! When you send your materials be sure to use lower resolutions for your pdf’s and jpg’s. As with all agents, use links to your clips. – ZAV wants you to speak some German. – I will include some sample ‘cover letters’ but no matter what language you write in, ZAV pretty much requires that you be able to communicate in German, however haltingly and that your sung German be decent. For anyone singing operetta (Soubrette and Spieltenor) you MUST have good stage German in both the sung and the spoken dialog. In these Fächer it’s advisable to have a dialog excerpt, prepared with coaches in Germany. – I would suggest studying German intensively for at least a couple of weeks before auditioning at ZAV. The Volkhochschule is inexpensive and in many cities. There are also many private tutors and the Goethe Institute. -You don’t have to be fluent, but do have to understand basic questions. – There is a 2-3 month wait for audition times, so write well in advance when you are making your plans. – Another useful subset of mostly established European agents can be found in the back of the “Deutsches Bühnen Jahrbuch”. These are agents who advertise in this professional handbook. While I cannot vouch for them, many of the names are long familiar to me. Some are primarily concert agents, so do check out their sites. – This wonderful resource, first published in 1889, by the union representing theater, film, radio and television employees, lists virtually every department and every employee in every theater. – Here are the ones I found in the 2016 edition, in no particular order. 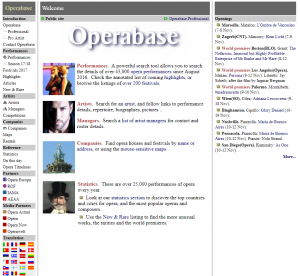 You should be able to check them as well in the Operabase listings.